In November of 2012, Jean Marcoccio had surgery to remove the large buffalo hump on the back of her neck, alleviating the chronic headaches and sleeplessness that plagued her for years. She’s more physically comfortable and also less self-conscious about her appearance out in public. MassHealth, Jean’s health insurer, covered the surgery. That’s the good news. Now, the bad news: it took nearly three years of wrangling by Jean and her doctors to get coverage for the operation. Jean’s buffalo hump was caused by HIV-related lipodystrophy, and health insurers routinely deny coverage for treatment on the grounds that it is cosmetic or otherwise not medically necessary. Jean, 65, was no exception to this rule. In Jean, the lipodystrophy also caused significant and disfiguring fat accumulation in her upper body – including under her arms and in her upper arms – and significant fat loss in her buttocks, thighs and legs. Her body is very unbalanced, which aggravates pre-existing back problems and leg ailments. “Sometimes I just want to come home and sit down and cry because it hurts so bad,” says Jean, a former social worker and case manager. About seven years ago, MassHealth rejected Jean’s request for coverage for a procedure to remove the significant fat accumulation under her arms. Fortunately, Jean’s daughter worked for a plastic surgeon who generously agreed to perform the surgery for the $2000 cost of the anesthesia. Jean, who lives on a fixed income, and her daughter, who held three jobs, pooled their resources. “We used our credit cards,” she says. 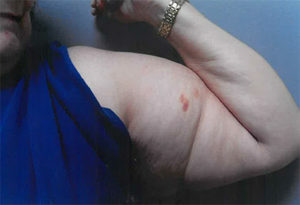 Jean is now attempting to get approval from MassHealth for a procedure to remove the abnormal fat accumulation in her upper arms. Lifting her arms over her head is painful, and it is difficult for Jean to get her blood pressure taken, which she must do frequently, because the cuff doesn’t fit around her arm. Her arms bruise because her sleeves are so constricting, but going out with short sleeves is unbearable because of the way people react to her appearance. Jean is grateful for the commitment her health care providers have made to ensuring she receives the lipodystrophy treatment she needs, but she knows it requires tremendous time and patience from them.